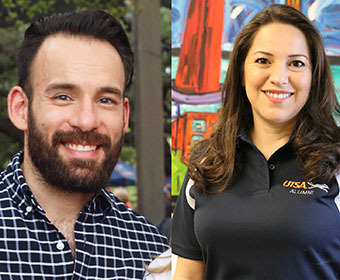 Phillip Morales ’08 and Yvonne Addison ’09, ’18, serve as president and vice president of the UTSA Alumni Association. They lead a board of 25 directors responsible for supporting UTSA higher educational goals and charitable engagement relevant to the mission of the university. (Sept. 24, 2018) -- The UTSA Alumni Association Board of Directors announces new leadership and the addition of three new members. Phillip Morales '08 has succeeded Andrew Waterman '03 as president. Yvonne Addison '09, '18, was elected vice president. The rest of this year’s executive committee includes Noel Ayala '07, who was elected treasurer, and at-large committee members William Di Filippo '91, '11, John McFall '92, Nancy Ozuna '93, '95, and Mike Setser '97. Each will serve a one-year term on the executive committee. The board also welcomed three new members: Cynde Bard '10, Laura B. Garcia '06 and Fidel I. Moreno '91. Addison, for one, is proud to continue volunteering for the Alumni Association, especially as it grows in service to UTSA students and alumni. She mentioned that over the last few years there has been increased engagement from graduates and the association with new events, including the start of a new alumni group for the College of Engineering and co-hosting a casino event with a UTSA marketing class. The Alumni Association Board of Directors is comprised of 30 elected members representing various class years, majors, backgrounds, professions and geographic areas, who volunteer their time to direct the association budgeting and programming. Each director serves a three-year term unless elected to fill a vacant position. The UTSA Alumni Association supports the educational activities of The University of Texas at San Antonio and policies generally favorable to higher education, as well as to engage in other benevolent and charitable undertakings relevant to the mission of the university. Learn more about the UTSA Alumni Association board including how to nominate someone.